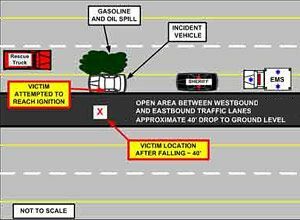 Overview of the incident scene showing vehicle placement and victim location. TURTLE CREEK, Ark. — An Arkansas firefighter who was killed after falling from a bridge may have been disoriented by glare from scene lighting, an investigation has found. Lt. Paul Baker, of the Turtle Creek Volunteer Fire Department, was attempting to disengage a wrecked vehicle from ignition when he lost balance and fell over the bridge sidewall on August 10, 2007, the NIOSH fatality report released Tuesday said. In the darkness of the early morning, he was facing the headlights and emergency lights from all five emergency vehicles on the scene. Investigators determined the glare from the lighting could have disoriented him and caused him to miscalculate his proximity to the sidewall. "Emergency responders should be made aware that depth perception and situational awareness can be hindered by the glare from incident scene lighting and they should take precautions when working under these conditions," NIOSH recommends in the report. As a result of the findings, NIOSH also recommends reducing glare by turning off headlights in the presence of high level lighting directed downward on the incident. "Ideally, when traffic around the scene is considered secure, and high level lighting is utilized and adequate, forward facing headlights should be turned off and the number of flashing emergency lights should be limited," the report said. The report also cites the approximate 32-inch height of the sidewall as another key contributing factor in the fatality and recommends departments develop standard operating procedures for low sidewall heights if present in the jurisdiction. Specifically, "procedures that include repositioning incident vehicles away from sidewalls if possible, and/or utilizing fall protection when feasible and appropriate, should be developed," the report said. Lt. Baker was prompted to remove the keys from the vehicle after he noticed fuel leaking onto the roadway while the vehicle motor was still running. To mitigate motor vehicle crash hazards caused by fuel spills, the report recommends fire departments develop standard operating procedures for mitigating motor vehicle crash hazards caused by fuel spills.